Scarves are the unsung heroes of any man's wardrobe. Knitted, woven, or silky, the scarf is an accessory that will make you instantly stylish. 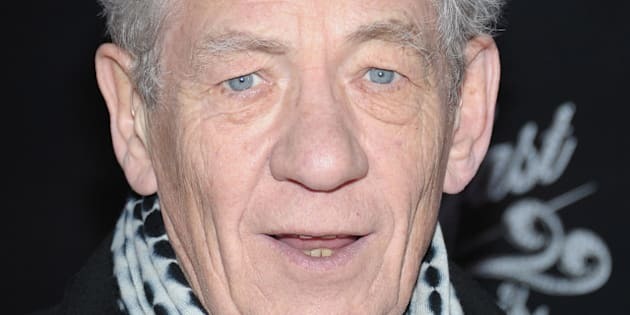 Scarves in the spring may seem confusing to Canadian men, but a lightweight scarf in the spring adds a little warmth and a lot of style in the early days of the season. Scarves are the unsung heroes of any man's wardrobe. Knitted, woven, or silky, the scarf is an accessory that will make you instantly stylish. Scarves in the spring may seem confusing to Canadian men, but a lightweight scarf in the spring adds a little warmth and a lot of style in the early days of the season. 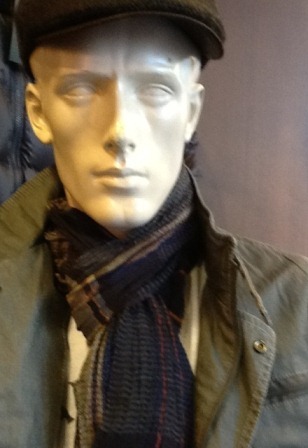 More Canadian boutique men's stores carry men's spring scarves -- here are a few from Vancouver, Toronto, and Regina. 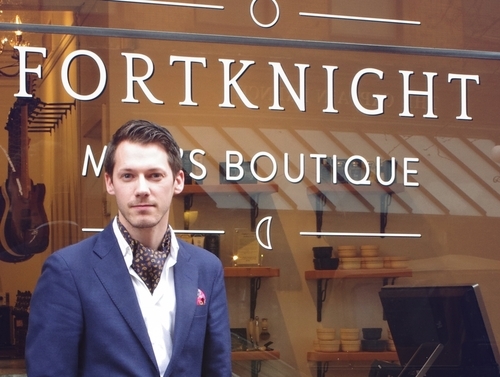 When I came across Fortnight Men's Boutique on Facebook, I immediately became a fan. The Vancouver store sells guitars, fountain pens, and sartorial oddities from all over the world, including scarves. Proprietor, Tyler Johnstone, suggests pairing a bright yellow or orange neck scarf with a blue blazer for a splash of colour. Tyler likes the versatility of the silk scarf that can be worn tucked into the collar of the shirt, or knotted with the tails out. "For a stylish casual Mediterranean look, try a silk scarf tied ascot-style," he says. "Think of it as a casual version of wearing a tie." A loosely-tied ascot conjures visions of uber-suave Cary Grant and kooky, creative Miles Davis, and it's a fun way to punch up a collared shirt. Below, Tyler models a jaunty violet/small paisley scarf, $129.99, made exclusively for FortKnight Boutique. Silk is a warm natural fibre, so if you're a guy who heats up easily but still wants the crispness of silk around his neck, look for a silk blend. I visited philip in Hazelton Lanes, Toronto (a spin-off of Nanni Couture), to look at their gentleman's cotton and silk blend scarves. Unlike the silk, cotton breathes and allows air flow around the wearer's neck. 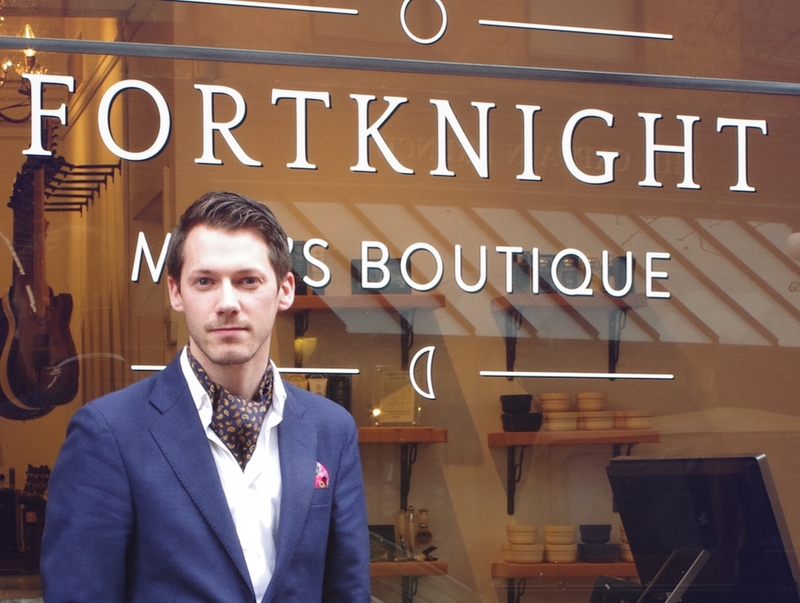 Owner, Philip Zappacosta, says, "Scarves are a great investment for guys who stand apart." Suit with scarf -- instant style! 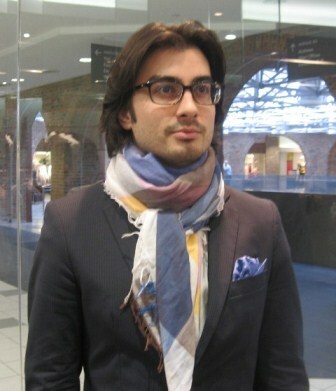 Zappacosta recommends a scarf to suit a man's colouring and coordinate with his wardrobe, tying all pieces together. 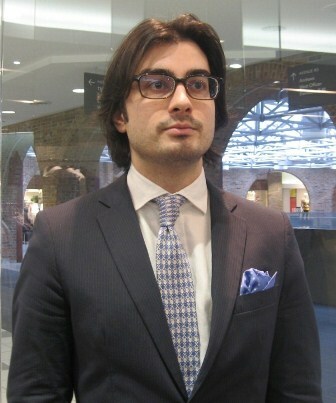 He showed me a large, slightly crisp, colourful, cotton and silk square-shaped Corneliani scarf, made in Italy, at $295. A versatile scarf like this goes well with soft-shouldered sports jackets and other casual pieces like loose-knit spring sweaters, but can certainly dress up a suit. Scarves are meant to look "thrown on" but they are anything but -- you'll want to spend some time arranging the fabric. Wrapping your scarf around your neck several times will create volume around the face, and longer scarves can be worn European-style, doubled and looped around the neck with the ends pulled through the loop at the front. For those in parts of the country still in snow, you'll want to mix your cotton with wool going into April. The cotton in the scarf will give you the hope of spring while the wool keeps your neck warm in your still wintery temperatures. Oliver's Menswear in Regina carries a 60/40 blend by Dante at $110. This scarf is a muted large-scale plaid with fringe. The crinkled weave gives the fabric texture that undoubtedly adds to the warmth of the scarf, while retaining its lightness. Seen here, it is tied European-style, but for added warmth, fold your long scarf in half lengthwise, and use the doubled fabric to loop and pull around your neck. Bring it closer to the neck by tightening by the loop. For those who like markets, thrift shops, and vintage stores, hunting for scarves is great fun, and finding the right piece is thrilling. But no matter what your budget, adding a scarf will get you noticed, and for style-savvy men, there is scarcely a better accessory.